Two times a year Belk's Department Stores offer the area's various non-profit organizations the unique opportunity to reach, teach and serve their communities while earning lots of money in the process. Belk's Department Stores will hold unprecedented sales on everything in their stores affording the consumer a huge 20% to 50% savings. These Charity Days sales are held before regular store hours (from 6am until 10am) and the only way a customer can enter the store or to participate in and take advantage of the sale is by showing a ticket. This year's sale will be held on Saturday, May 2, 2009. These tickets are sold by the before-mentioned non-profit organizations who, by the way, keep every penny they receive from their sales. The tickets are only $5 each and the customer will receive his/her $5 back when they make their first purchase! What a great way for Belk's to reach out to the community and even a greater way for the various charities to better identify themselves, what they do and how they do it and, at the same time, raise lots of money! Dixie Land Guide Dog Users has successfully participated in the sale of Belk's Charity Days ticket sales since 2005 and we embrace the opportunity to be a part of this year's event. 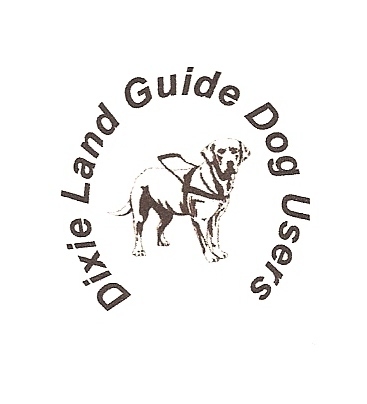 From the funds thus far raised by these ticket sales Dixie Land has been able to sponsor our annual Southern Regional Top Dog Workshops, originated in Charleston and hosted in 3 other states! This weekend-long event was created in an attempt to educate the sighted community as to the special needs of the blind; to enlighten the blindness community on the various life-enhancing resources available to them; and, simply for everyone to join together in fun and fellowship! Dixie Land knows the importance knowledge plays in an active community-blind or sighted-and reaches out to everyone by offering special "Sensitivity and Awareness" training to businesses, organizations, schools and various other groups. Such training allows a better understanding of and respect for those of us who must use a trained dog or long white cane for our safe, independent travel. We believe that we, the blind, must make a more active presence in our cities, towns and communities if we hope to be better recognized by the sighted. Therefore, Dixie Land has scheduled a series of programs with the SC Commission for the Blind and the SC School for the Deaf and Blind to inspire, motivate and reassure our blind brothers and sisters statewide. Dixie Land is actively trying to erase the pitiful image of the blind beggar on the street corner by projecting a positive public image of one who is self-reliant, confident and very competent. Most importantly, Dixie Land Guide Dog Users is compiled of Christians, who show the world that, though some of us cannot see, God continues to use us by shining His light of love to guide others to Him. Indeed, our eyes may be broken, but our spirits are well and thriving! Each time we get an opportunity to sell a Belk's Charity Days ticket, we are given the chance to witness to someone. Participating in Belk's Charity days allows us to tell the community what we do; educate others on our special needs; raise funds to better educate, motivate and inspire others; and to witness for God!